It’s time to step back into the world of Eorzea, put on your Warrior of Light hat once more, and liberate Ala Mhigo from the empire. It’s time for Final Fantasy XIV: Stormblood. So Stormblood came out around a month ago, and in that month a lot has happened in the game. Between server issues due to DDoS attacks and the release of the big end-game raid content, things have been both good and bad. This review will be focusing on the game and NOT the server issues that plagued the first week or two of the release. In Stormblood, you start things off by heading East into Ala Mhigan lands. Your goal? Free them from the empire. You meet faces both new and old, friendly and unfriendly, but things take a turn for the worse when the emperor tosses you to the side like garbage. It’s at this point you decide to turn to the other half of the expansion – Doma. Again, you’ll meet plenty of new and old faces here, and perhaps you’ll manage to succeed where those before you have failed (or not bothered to try). Stormblood continues Final Fantasy XIV’s absolutely amazing storytelling. You will fall in love with the characters, though some moments may end up a bit predictable. I chose to take my time with the story in this expansion and I’m glad I did as it really let me take it all in (and it let me not have to deal with the server issues as much). Content flowed fairly well for most of it, though as I go into the second half of the 60’s I did occasionally have to stop and do other content just to get back on level for the story. This was probably impacted partially by not doing all of the sidequests available – and there was a lot of sidequests in every single hub area – but I do wonder if they could’ve done a bit more to help you along. Luckily, the Roulette system provided a healthy boost to your experience amounts and would quickly get you back on track – if, of course, you weren’t a DPS job. 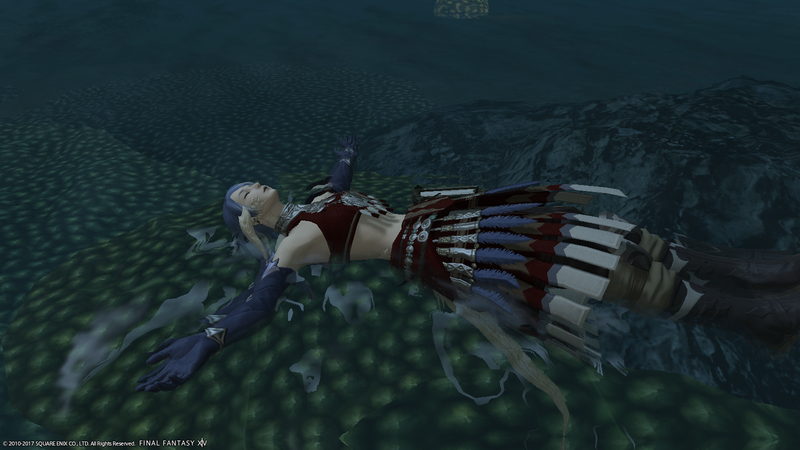 Stormblood also saw the introduction of swimming and diving, though be warned if you have a lower end computer you will likely have severe framerate issues underwater. Stormblood saw the introduction of two new DPS jobs, Samurai and Red Mage. The biggest issue here of course is that DPS queues were already horrendously long, so the addition of two new DPS jobs along with the sheer amount of people trying to do the new content caused a lot of queue nightmares to happen. 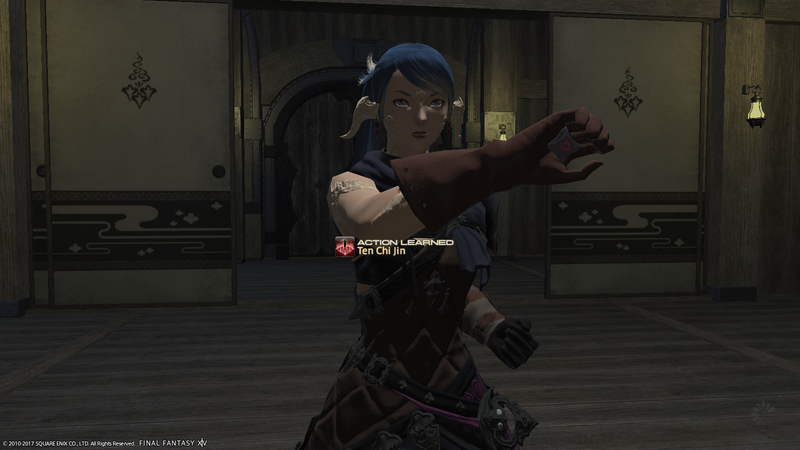 Dear Square Enix: In the future, please don’t add ONLY two new DPS jobs in a single expansion. The DPS already have it hard enough as it is. Anyways, both Red Mage and Samurai did prove to be quite good additions to teams, with Samurais bringing a high pure damage, and Red Mages providing good damage. With them starting at 50, players jumping into them had a lot to take in, and with how combo heavy Samurai was, a lot of information was easy to just look over and miss initially. Having a good system in place to allow players to properly learn their combos while doing other content would have been nice, but unless I missed it you were stuck either using Palace of the Dead (which is a poor place to learn combos) or limping along in other content until you figured it out. 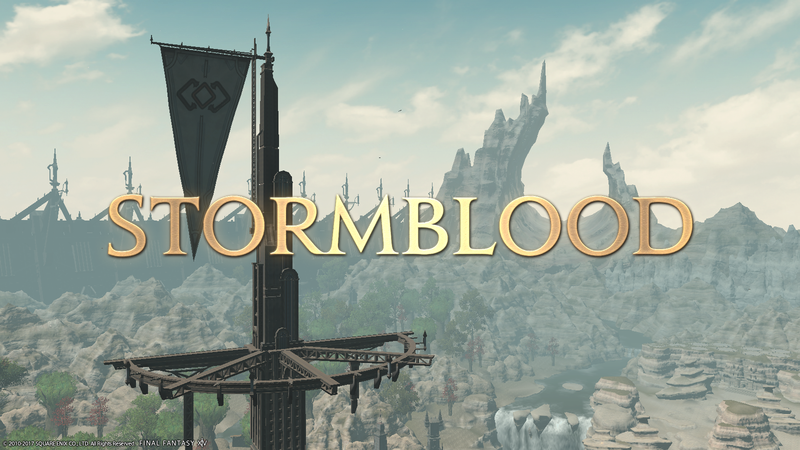 Along with the two new jobs, Stormblood saw a massive overhaul to a good chunk of the combat system. Every single job saw a number of skills removed and others adjusted. The expansion also saw the introduction of the job meters, with each job’s doing something special for them. For example, I primarily played Ninja while I was going through the expansion, and Ninja had two main job meters. The first one was simply a timer for Huton, now moved from the status effects area, and while it took me a bit to get used to I eventually did. The other was the Ninki Gauge, a gauge that built up as you did auto-attacks (and eventually also when you used Mug). This unlocked some pretty strong skills to use, and it became a fun balancing act to figure them out. Some other jobs didn’t make out as well in usefulness of their gauges. Let’s take Summoner for example. During Heavensward, Summoner’s were able to build up for “Dreadwyrm Trance”, a big burst of damage that utilized their Aetherflow stacks. With Stormblood, these two were merged together, and you now had to plan out your stacks against your build-up towards Trance a whole lot more. This has turned into a double edged sword for them – they’re one of the best DPS in the game if whatever you’re doing doesn’t require them to move and they can optimize all of their damage, but as soon as they need to move they just tank. I had initially been planning to play Summoner for this expansion, but after trying to play it right at launch everything just felt completely off and I quickly opted to go for Ninja instead. My hope is that they will be able to do something to help out Summoner here, perhaps in some way re-separating their Aetherflow stacks from building up towards Trance. While a lot of other jobs didn’t initially fare too well at launch, post-launch patches have seen a huge number of improvements come to certain jobs. 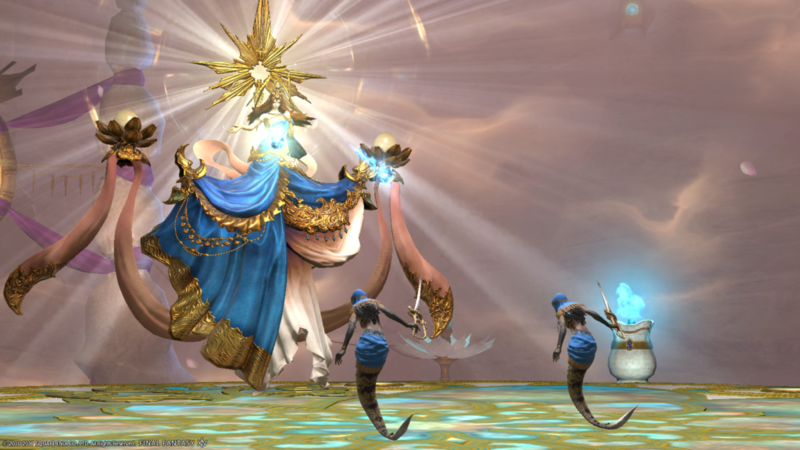 While a job like Scholar is sitting in the same awkward boat as Summoner – skills are really clunky and they don’t keep up as well – Warrior and Dark Knight saw large improvements from their initial experiences at the launch of Stormblood. Well, it did also help that they reverted their change on not giving tanks Strength on their accessories anymore, since it turned out tanks really needed it to be any good. Moving on from the jobs, let’s talk about the dungeons. I personally enjoyed all of the dungeons that were present throughout the story, and the two dungeons currently available as part of the Expert Roulette were also pretty good. Each of the primals were also pretty good, although the reliance on needing to use “Duty Actions” did get a bit annoying. They took out all these class actions because things were getting too crowded, but then they put in more and more of a reliance on Duty Actions. While I haven’t done any Omega, I have heard some talk that these are also present in there. As an overall experience, Stormblood is an amazing adventure. One thing I could’ve done without was how “plastic” some of the character models looked, which did take away a bit from the visuals to me. There was also some cutscenes that seemed to be lower quality than others, even ignoring the fact that my computer can’t run at the best of graphics. However, the sound direction was phenomenal, though the theme song doesn’t quite top Answers and Dragonsong in my opinion. Other than the theme song though, all of the music was amazing, and I’m looking forward to being able to add the soundtrack to my playlist. Should you play Final Fantasy XIV: Stormblood? Well, that’s up to you. As the expansion count grows, so too does the barrier for entry. Luckily, they have added jump items to make the sting a bit less painful, although I do still recommend experiencing the story as a whole. Final Fantasy XIV has some of the best writing available in the series, and Stormblood just continues that tradition. 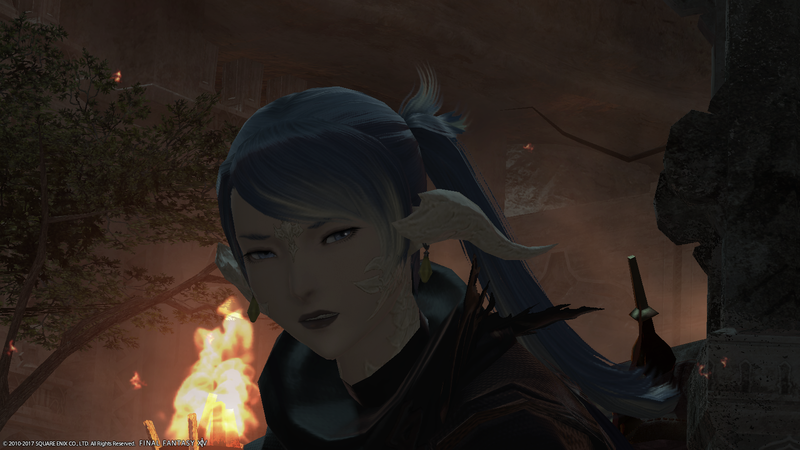 So yes, I do recommend playing Stormblood, and if you’re one who just wants to get right to the content then you have that option available to you (at a cost, of course). I do hope that they’re able to get the job balance fixed through the future patches, and that they learn the lesson in not adding just two DPS jobs in a single expansion. Where’s my Blue Mage, Square Enix? I was provided a code for the PC version of Stormblood by Square Enix for free for use in this review.